A dish that's truly remarkable and a must try for all lovers of Punjabi food like me. I love the flavour of kasoori methi and so love this dish and this side-dish is very regular in my household. Using Kasuri methi(dried methi/fenugreek leaves) instead of the regularly used fresh methi(fenugreek) leaves gives this dish its unique flavour. 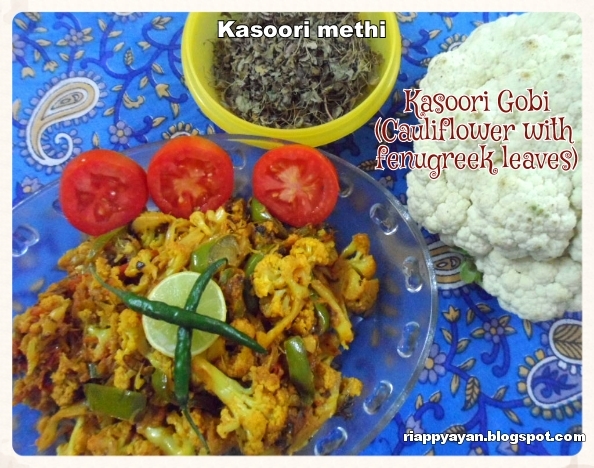 Gobi kasoori is prepared by stir frying cauliflower florets with kasuri methi/dried methi leaves and other Indian spice powders. Methi, in Indian Kitchen, especially in kitchens in the Punjab plays a very important part. The bitter taste of the kasuri methi is removed when it is soaked in water. Cumin seeds(jeera) : 1 tsp. Kasuri methi(dry fenugreek leaves) : 2 tblsp. Heat 1 tblsp. oil in a pan, fry cauliflower pieces in little salt and a pinch of turmeric powder in low flame with lid closed. Saute until they are almost done or about 5 minutes. keep aside. 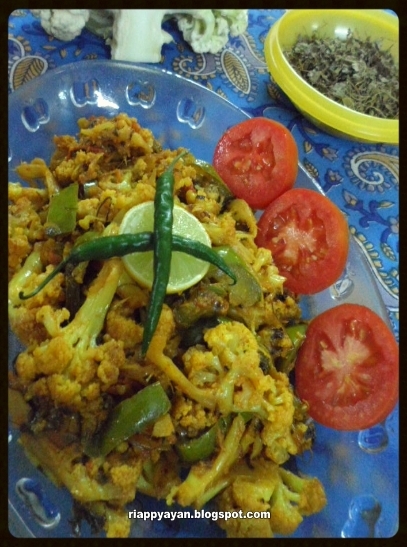 In the same pan, add 1 tblsp oil and heat, add cumin seeds, when they crackle, add sliced onion and chopped green chillies. Add sliced capsicum now. Saute till onions are soft and has changed color. Then add ginger-garlic paste, saute for another 2 minutes, then add all powdered spices with little water. Add chopped tomatoes and cook the spices with tomatoes, when oil seperates and tomatoes are pulpy, add cooked cauliflower pieces and kasoori methi/dry fenugreek leaves. Mix well with spices and season with salt and sugar. In low flame, let it cook covered for another 3-4 minutes or until cauliflower has cooked completely and spices has well incorporated with veges. You can garnish with fresh coriander leaves, it's upto you, not really needed. 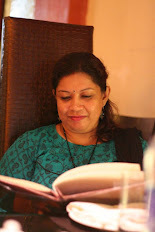 Enjoy with hot rotis, parathas or even with rice. Well presented and looks delicious.